Ecuador’s Tungurahua volcano has been erupting intermittently for the past eight years. In the summer of 2006, the volcano erupted ash up to 19 kilometers in the air and covered the surrounding countryside with lava, ash and mudflows. In August 1999, Tungurahua erupted to life after 80 years of rest. That eruption has waxed and waned in the past eight years, but it has not quit, much to the consternation of the thousands of people living in its shadow. People have repeatedly been evacuated from their homes, sometimes for months on end. Unfortunately, when residents return weeks or months later to a standing house, they start to question the credibility of the scientists and emergency managers who issue the warnings. And that can lead to disasters: If there is a credibility problem, people might not take the next evacuation warning so seriously. Thus, scientists need to better predict — and communicate — the dangers arising from living in the shadow of volcanoes. Sitting high in the Andes of central Ecuador, Tungurahua lies along the Pacific Ring of Fire, a broad geological region characterized by its clusters of volcanoes and its propensity for earthquakes. Like the other volcanoes and earthquakes in the ring, the volcanoes in Ecuador are caused by subduction, as the oceanic Nazca Plate slides below the South American Plate. At the northwestern edge of South America within the Northern Andean Volcanic Zone, Ecuador exhibits the continent’s highest volcanic density, with more than 250 volcanoes. Furthermore, more than half of the country’s 13 million people are vulnerable from these volcanoes. The 5,019-meter-high Tungurahua is one of 17 active volcanoes in the country. The Tungurahua volcanic complex, located in South America’s eastern metamorphic belt called the Cordillera Real, is made up of three different edifices — Tungurahua I, II and III — of which the first two collapsed millennia ago after a considerable period of activity on the western side. Today’s active stratovolcano, Tungurahua III, is built on debris deposits of the last major collapse and contains various andesitic lavas, which in the past reached a Volcanic Explosivity Index (VEI) of 3, while occasional dacitic lavas have been associated with eruptive phases reaching VEIs of up to 4. VEI is a measure of a volcano’s destructiveness, ranging from 1 to 8, based on the volume, duration and height of material expulsed during an eruptive phase, with higher numbers indicating more destructive eruptions. Andesitic lavas, which are most prevalent in the Andes, have lower silica concentrations than dacitic lavas; the higher the silica content, the more violent an eruption tends to be. The growth of the steep-sided volcano is from repeated eruptive phases of ash falls, lava, mudflows called lahars, and pyroclastic flows (fast moving, high-density mixtures of hot rock fragments and hot gases), which generally have occurred approximately once per century, each lasting up to a decade. Since its previous eruption in 1916, the volcano remained relatively dormant until 1993 when seismic activity gradually increased. 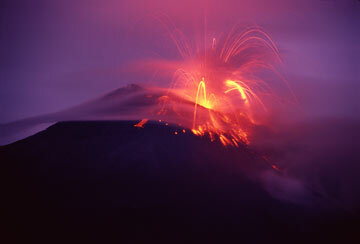 In August 1999, Tungurahua entered a new eruptive phase that continues today, with eight years of continuous activity. Since 1999, Tungurahua’s magmatic, andesitic activity was characterized mainly by explosive “strombolian” eruptions of gas, ash and rock fragments usually covering the southwestern flank of the volcano, and occasionally by minor lahars due to the accumulation of ash on the flanks of the volcano. The volcano exhibited different eruptive cycles, roughly every 12 to 18 months, from 1999 to the spring-summer of 2006. Then things got interesting. From May 10 to 16, 2006, a new eruptive cycle started with high-frequency explosive eruptions, with ash reaching up to 19 kilometers above the volcano. Then the volcano quieted again. On July 14, however, a 15-kilometer-high eruptive column produced the first pyroclastic flows and accompanying minor lava flows that descended down the western flank and reached several small villages. Gas and ash emissions continued with an unusually high frequency of smaller to moderate eruptions. 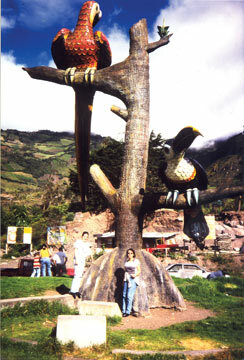 This statue of the “Birds” near Baños, Ecuador, was a popular tourist spot before Tungurahua buried it with pyroclastic flows during its current ongoing eruption. 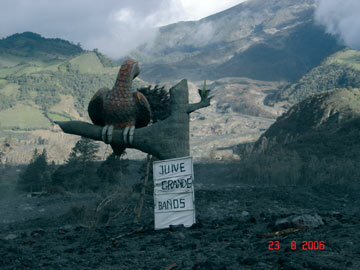 The 26,000 residents of Baños were evacuated when Tungurahua first reawakened in 1999, but subsequently returned to their homes when the volcano failed to produce a massive eruption. In 2006, some people who had returned to their homes in this region were killed when the volcano erupted explosively after years of lower activity. About a month later, the strongest eruption since the reactivation of Tungurahua in 1999 produced 20 pyroclastic flows. These flows covered a large portion of the western flank of the volcano, killing seven people in a previously stated “safe zone,” devastating at least five small villages and destroying some 200 square kilometers of cultivated land. This eruption, on Aug. 16 and 17, 2006, had a very high social and economic impact and covered a large part of Ecuador. Ash and gas clouds reached a length of at least 800 kilometers and a width of some 200 kilometers to the west of the volcano. Because of this volcanic activity, authorities have frequently alternated the volcano alert levels between yellow, moderate orange and orange, which resulted in several separate evacuations. One such evacuation in October 1999 involved 26,000 residents from the city of Baños, situated in the foothills and arguably protected by natural barriers, including two deep gorges to the west and east of the city, and some other nearby villages. But a big eruption didn’t happen. government. In July 2006, when the first pyroclastic flows started on Tungurahua, a few hundred people fled from their homes on the western flank of the volcano. And after the eruption of August 2006, 5,000 more people fled from the same area or were evacuated into refugee camps surrounding the volcano, remaining there for several months. The eruptions in July and August 2006, as well as previous phases of high volcanic activity, were inadequately monitored as demonstrated by several failed predictions. During the August eruption, the previously installed alarm system with sirens was disabled, as well as most of the monitoring equipment, when pyroclastic flows destroyed the power lines that ran the system. Therefore, one of the major consequences of the aforementioned disaster has been the development of modern hazard maps to avoid or reduce further human life and economic losses during the continuous volcanic activity of Tungurahua. Researchers in Ecuador have been working on risk maps of Tungurahua and other volcanoes to precisely determine which regions face the greatest dangers. To that end, a Geographical Information System (GIS) for Tungurahua and its surroundings has been implemented to assess the volcanic danger of the area. GIS is an ideal tool to assess the danger of natural hazards because it gives researchers the opportunity to integrate many different datasets and information systems to create a broad overview of how a natural hazard may impact a community. This holistic approach to hazard preparedness has enabled communities to reduce potential risks and increase their preparedness. The preliminary map of Tungurahua combines volcanic hazard zoning with four layers of economic and population data: population numbers, infrastructure, land use and standard of living. Involving the human component thus creates a risk map, as opposed to a simple hazard map, which would merely indicate how the volcano might erupt and where flows would go. Although the volcanic hazards at Tungurahua are complex, this map also incorporates different potential future volcanic and subsequent economic scenarios. The goal is to present on a single map the risks of volcanic activity in terms that the public can better understand. The map, which demonstrates the potential cost of the volcano to the Ecuadorian government, is freely available on the Internet. Although volcanic hazard maps are now available at many volcanic areas, volcanic risk maps are less common and offer some special advantages in volcanic hazard communications efforts. They can be used to forecast the cost of volcanic activity, which is helpful in securing support for mitigation efforts. They may be used for planning mitigation, because sensitivity analyses of uncertainties in hazard zonation or recurrence intervals of various types of activity can be tested against economic and population data for cost effectiveness and sustainable development in hazardous areas. At Tungurahua and other volcanoes, scientists and emergency managers want to reduce the human risk, and part of doing that is creating better predictions and more useful evacuation warnings. This is an incredibly difficult, but worthwhile, undertaking. What researchers need to communicate more effectively is that losing one’s home is better than losing one’s life — which, surprisingly, is not a message that always comes across. Risk maps provide a better understanding of the general threat provided by volcanoes in a given region, and hopefully people will recognize that sometimes they need to move in order to reduce their exposure to risk. In Ecuador, we hope that these risk maps will help prevent the loss of life that comes with not heeding volcanic warnings. Toulkeridis is at the Center for Geology, Volcanology and Geodynamics, Universidad San Francisco de Quito, Circulo de Cumbaya, in Quito, Ecuador. E-mail: theofilost@usfq.edu.ec. Buchwaldt and Addison are in the Department of Earth and Planetary Sciences at Washington University in St. Louis, Mo. E-mail: buchwaldt@levee.wustl.edu, aaddison@wustl.edu.